Christmas Eve and officially the start of my ten-day break from the ‘necessary’ routine of work. 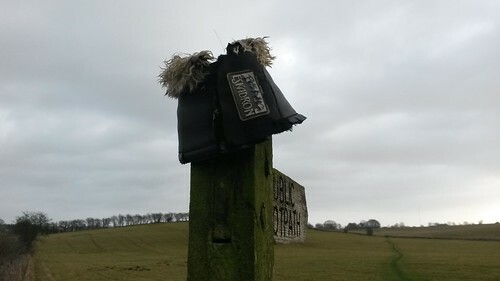 Of course, I was going to spend the day outdoors and I settled upon the idea of starting in Priddy and heading west to revisit Draycott Sleights Nature Reserve. I parked my car on the gravel in front of what used to be the New Inn pub (closed in 2013). This is one of two inns that the immediate area has lost in recent years, while the Queen Victoria remains open, just around the corner on Pelting Drove. 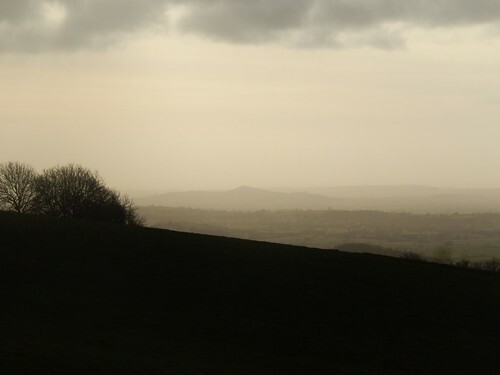 I felt somewhat uncomfortable, seeing as mine was the only car there… So uncommon for a weekend on the Mendip Hills. 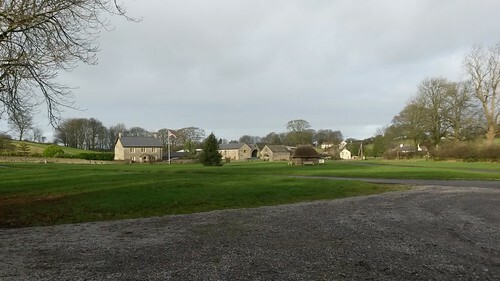 Bad weather had not been forecast and, while there is no official ‘parking’ sign, there is a notice further along the grass that instructs drivers to keep off and use only the gravel. I wonder what could happen to this convenient space should the building behind be renovated in to a private home? From my car, I immediately joined the West Mendip Way. A very familiar route but, this was the first time I would see the newly-installed waymarkers. 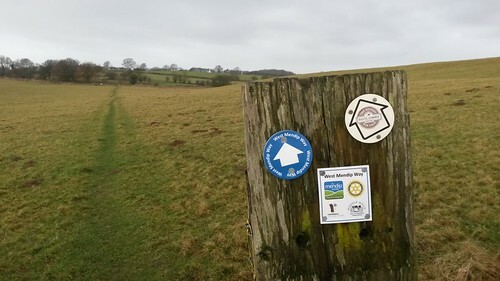 I’ve since read that these arrows have installed along the full length of the ‘Mendip Way’, which includes both the West and East stretches. As welcome as I’m sure they will be, I can’t help but wish they had something more to them, like the previous graphic including the image of Rotary International. 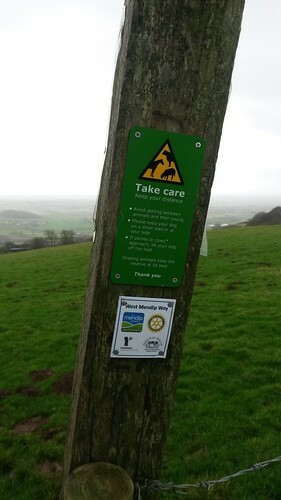 It was without colour but it helped to define the route from other public rights of way. Googling the name ‘Eskadron’ now, I realise it has something to do with horses and horse riding. 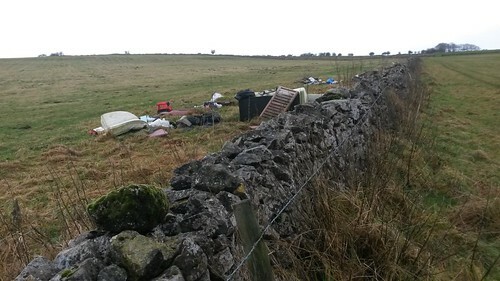 On the otherside of one dry-stone wall was a prime example of fly-tipping. 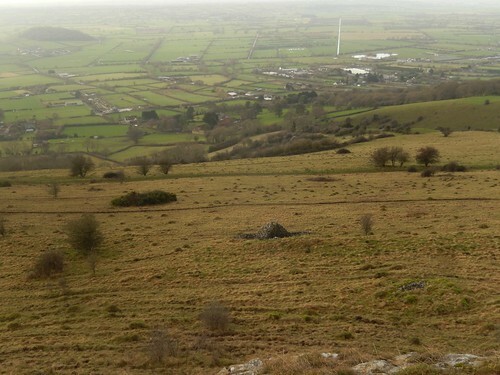 I don’t think I’d ever seen it on the Mendip Hills before but I sent a report through to the council, later in the day. At the entrance to this field, there’s a sign warning against such acts – and so, I can only imagine it must be a frequent issue, here. Maybe the farmer should also install a gate. 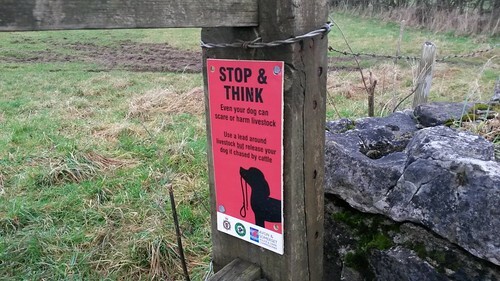 Further on towards Draycott, I find another sign – this one, informing dog owners of what to do when cows pursue… This is great! I’d not seen one of these before and certainly, not in this area. 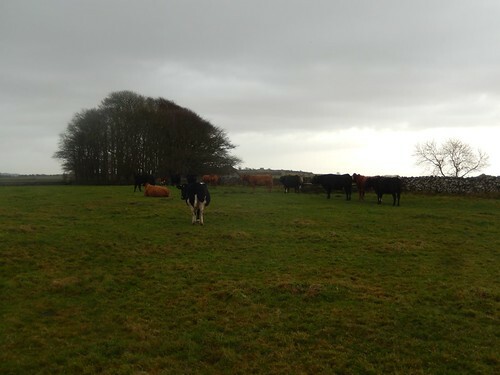 Our countryside needs more of this (let’s face it; we’re unlikely to win a ‘less cows’ election… If anything, their numbers will continue to expand). When installing new waymarkers, I wonder how many the average volunteer does in a day? Or, in a walk?… What happens when they’re in a rural area and the battery on their cordless drill runs out? Do they only use hand tools? I greet this sign with some irony, as I’m about to enter a field with at least a dozen cattle ahead of me. Still, the advice is sound. As walkers, we need this kind of information in so many areas. They were right on the line of the path and unwilling to shift from their wind-screen of a dry-stone wall. I gave them a wide berth; they gave me no bother. Beyond the cattle, the way follows a gradual descent. This would mean a sharp ascent, if I was to follow the same route back – and that’s before encountering the herd. You can just see Brent Knoll Hill on the faint horizon. 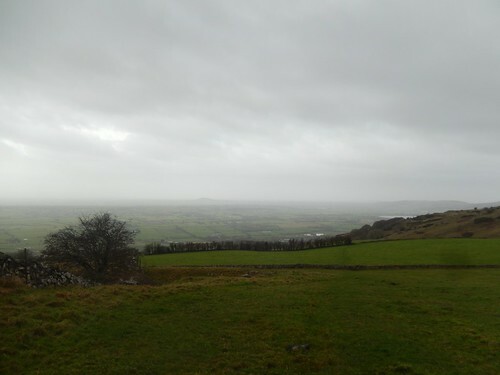 Another look to my left and I could just about see the tower on Glastonbury Tor, with thoughts of my intentions for New Year’s Eve. 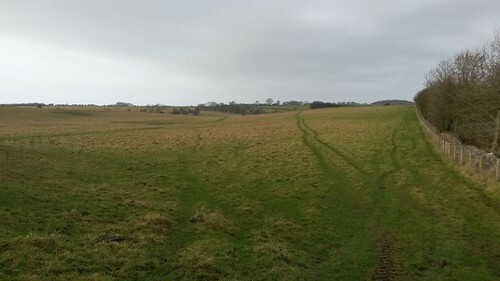 Leaving the West Mendip Way and its ongoing decent, I turned north towards the high ground of Draycott Sleights Nature Reserve. 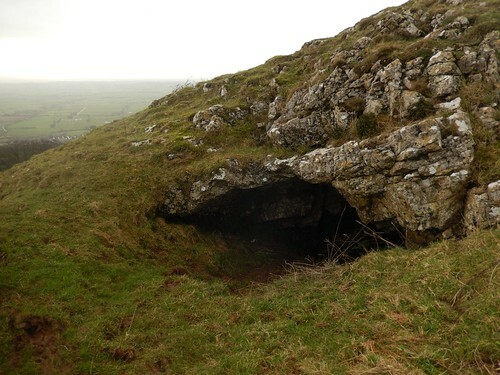 When I first started walking in 2012, I passed beneath this on a short, guided walk. 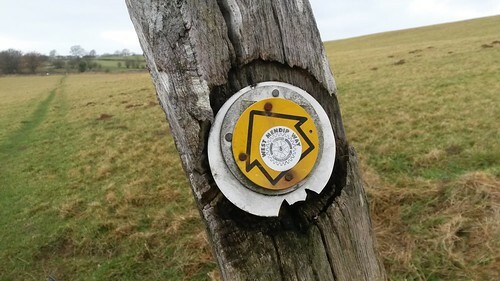 With no understanding of terms like ‘access land’ or knowledge of how to read a map quite well, I hadn’t felt confident straying from the signed footpath. This was my time to explore. 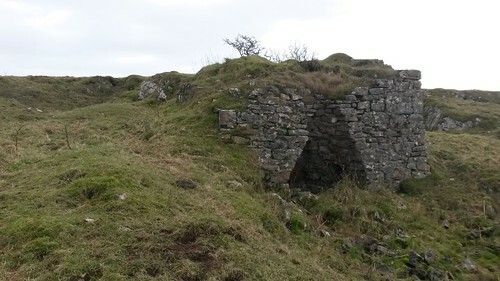 It was a short but very steep climb to the top, around which, I found this nook or alcove in the rocks. 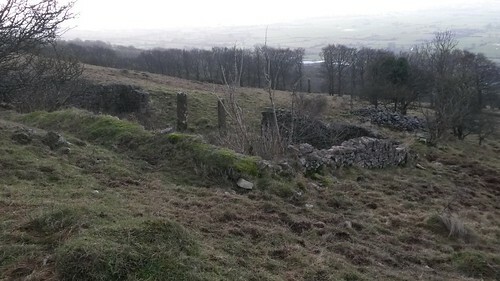 A possible home to some form of mammal. Maybe a good place to hide a GeoCache. Information boards display a couple of marked routes that you can follow up, over and around the hillside, here. 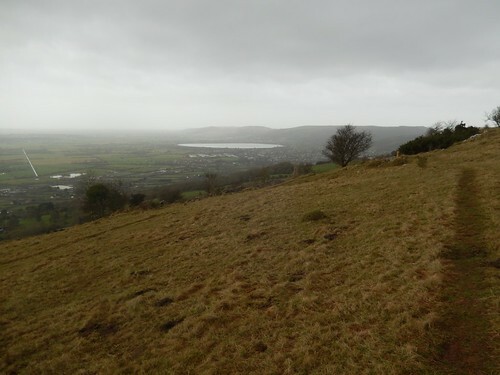 However, I found what may be a new favourite perspective over Cheddar Reservoir and with the Mendip Hills beyond. 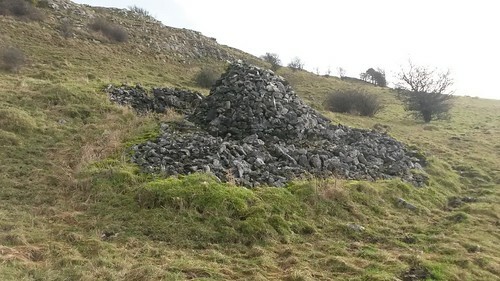 Elsewhere on the land of this nature reserve, I found the remains of small stone buildings – possibly shepherd’s huts or pens. A couple of small families had decided to have a picnic up here, in spite of the ever blowing wind. 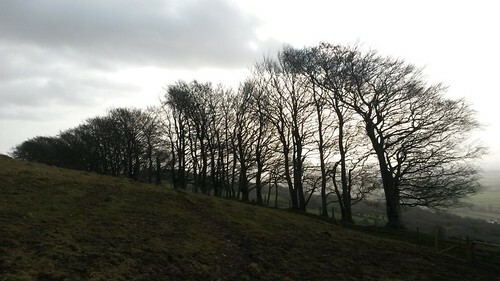 There’s a beautiful line of trees along the south-western face of the reserve. Shading the muddy path from the prying eyes of villagers far below. 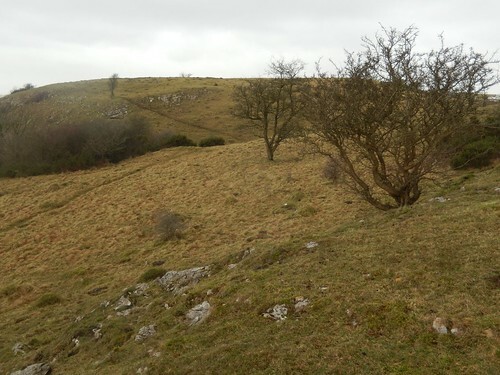 If you don’t fancy a cruel descent, which is immediately followed by an enduring ascent; this presents a conveninent shortcut along the West Mendip Way (unless you’re participating in an annual event). When the time came to begin my return journey, I followed New Road uphill for a good two-miles before joining the B3135. 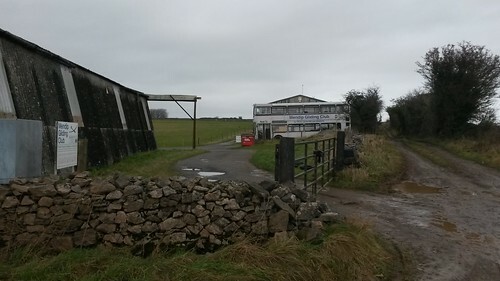 It was along here that I saw the redundant double-decker bus being used as an advertising board for the Mendip Gliding Club and their HQ. 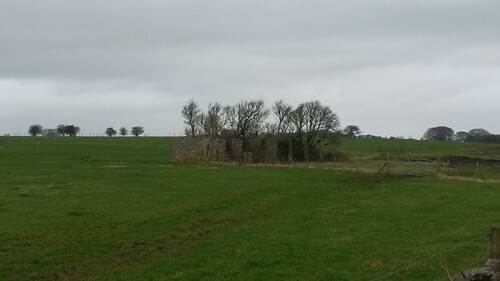 There was nothing eventful about the road walk, other than this glimpse of another old building, as I turned off towards Westbury-sub-Mendip. 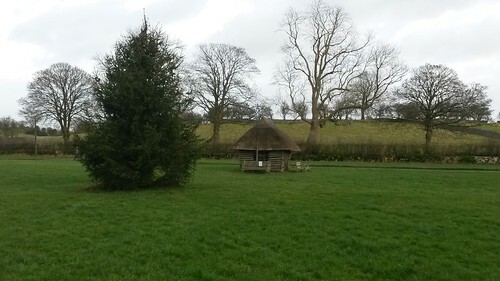 From here, I could retrace my outward steps along the West Mendip Way (having skipped the cow fields) and would soon arrive back in the centre of Priddy; complete with its Christmas tree on the village green, awaiting decoration.